We welcome applications from anyone interested in amateur radio, related communications technologies, and/or emergency communications (EmComm). Having an FCC amateur radio license is not required. To join, please complete a Membership Application form and mail it or e-mail it to the address on the form. Important: the Club rescinded the membership fee requirement. Please do not send a fee with your application. Voluntary donations are welcome but not required. Please notice that there is no requirement to participate in our emergency communications activities to join the club. We have members who are current and past NIH personnel, representatives from the local community, and others who have traveled to various DX/geographical zones. We do ask that children are accompanied by responsible adults, but other than that an interest in or curiosity about the many aspects of amateur radio will find a home here. NIHRAC members enjoy use of our Club’s facilities and resources, can participate in our meetings, projects and activities, and can serve as the backbone of the NIH emergency communication system during scheduled outages and in case of an emergency event. 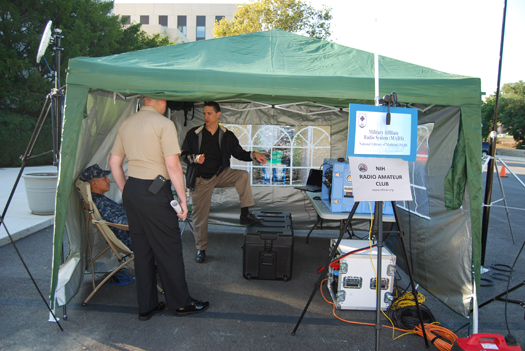 Club members can also participate on emergency communications drills and demonstrations at the NIH campus or vicinity a few times per year. Members' participation in emergency communications activities is totally optional and voluntary. However, we encourage members to participate on or witness such activities as they are excellent learning and community service opportunities (and usually a source of meaningful personal satisfaction, and reportedly fun). During our monthly Club meetings (see our Home page for details) we regularly have technical presentations and demonstrations about a variety of topics related to the hobby, and/or collaborate in technical projects of common interest. New members who have not yet received their amateur license from the FCC can be assisted by the club to go through the licensing process. The FCC licensing process is relatively painless. All levels of licensing require the completion of a multiple choice test, graded at the time of completion. The entry-level exam can be easily passed with a modicum of study, and the question pool can be found on the American Radio Relay League (ARRL) Website or the National Conference of Volunteer Examiner Coordinators (NCVEC) Website. Although we don't administer exams, there are several relatively-close organizations that do. For more information, please feel free to contact our members via our information email list info@nihrac.org.